Acoustiblok, Inc. completed an innovative international project for a ground-breaking cinema complex in Beirut, Lebanon. Cinemacity, as it is called, is an enormous complex in the heart of the city of over 300,000 square feet. “We are very pleased with the success of the Cinemacity project. This was a huge endeavor that took over three years to complete. It is now the new benchmark for future cinemaplexes across the world for what can be realized. Acoustiblok, Inc. completed an innovative international project for a ground-breaking cinema complex in Beirut, Lebanon. Cinemacity, as it is called, is an enormous complex in the heart of the city of over 300,000 square feet. Getting the acoustics right was paramount on the project and Shawn Saathoff, Vice President of Acoustiblok, was the Chief Acoustic Consultant on the project in collaboration with Da Da & Associates. Saathoff is a full member of AES, ASA and CEDIA. Nabil Dada & Associates is a leading interior design and architecture firm in the region and was behind the complex’s unique design. The exterior architecture, however, was designed by the French architecture firm Velode et Pistre. The compound includes 14 high-end cinema theaters, two of which are VIP, and all of which are equipped with cutting-edge technology. The complex hosts 2,400 seats and is covered by the world’s first unique dome lined with 256 LED screens. The LED screens continue down a long corridor leading to the lower level theaters. Projections of incredible visual graphics and numerous uses of lights on the escalators and walkways are designed to transport movie goers to another world during their stay in the complex. The building also includes large spaces that host restaurants and coffee shops found throughout the three levels. The project is managed by SOLIDERE, Hammad Atassi, owner of Prime Pictures and Mario Haddad, owner of Empire cinemas. The project cost $25 million to implement and they spared no expense in creating something iconic and state-of-the-art including the impressive acoustics of the complex. Acoustiblok’s Shawn Saathoff worked directly with Nabil Da Da & Issam Bassil of Da Da & Associates in response to the distinctive external architecture of the cinema by modifying the internal volumes and seamlessly integrating cutting-edge technology into their design to create a young and vibrant atmosphere. “The first step was to achieve the highest levels of sound isolation from cinema to cinema. The second challenge was to achieve intelligible localization of dialogue and a seamless envelopment of the surround field in each and every cinema,” Saathoff said. 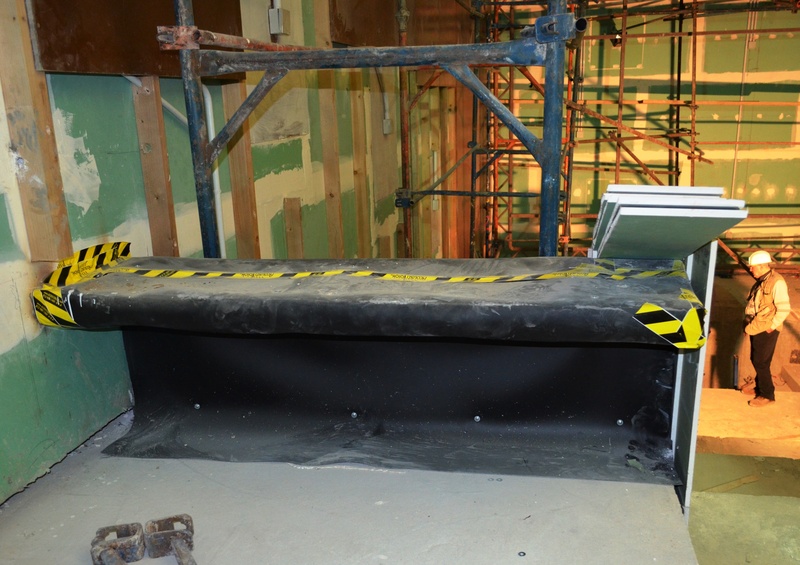 To achieve optimum noise and sound isolation, a “box in a box” construction technique was utilized for each of the 14 theaters in the cinema complex. A box in a box structure is basically an independent structure (box-the inside of the theater) isolated from the main building's structural foundation. Each theater required mechanically isolated floating floors, mechanically isolated floating walls, and mechanically isolated spring hung ceiling assemblies. Acoustiblok 4.88 isolation membrane was used in the construction of the walls, floors and ceilings to attain maximum airborne sound isolation. All of the above mentioned particulars are what’s behind the elaborately detailed interior finishes. And the majority of the interior elements were strategically designed to enhance cinematic experience. First reflections were controlled, surround envelopment was engineered, and picture quality was enhanced by eliminating distractive boundary reflections off the ceilings. 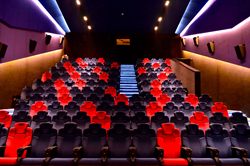 All elements of each and every cinema hall were methodically thought out and acted on during the design and development process at Solidere’s request. Solidere wanted to make sure this complex was cutting edge in terms of a cinematic experience. The Bar and Concession Area of the complex was also custom designed with QuietFiber® absorption materials that span the entire complex to reduce reflection build up and create a plush and inviting environment all while accenting the vision of cutting edge technology in a contemporary space. “Were the customers happy? Emphatically! In terms of performance, the cinema exceeded expectations, ticket sales shot up to 3,000 tickets per day and it was a new record in the region for such a short period of time,” said Saathoff. 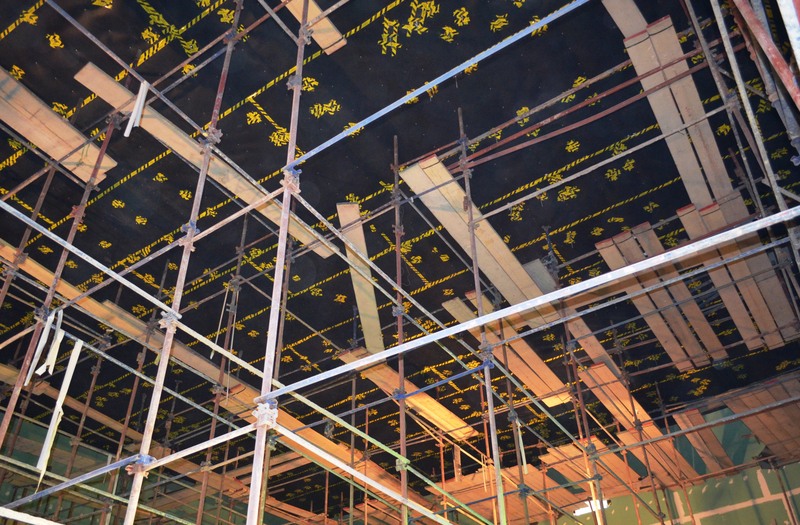 Acoustiblok sound deadening material was used because it dramatically reduces the sound transmissions through cinema walls, ceilings and floors. The unique linear attenuation that is created when Acoustiblok material is added to gypsum assemblies provides enhanced noise isolation at the same frequency ranges gypsum inherently has deficiencies. These frequency ranges are still apparent with as much as four layers of gypsum applied to a wall assembly. Acoustiblok changes the internal damping of the wall. Acoustiblok not only adds essential mass to the wall, but it also enhances the flexibility and stiffness changing the natural resonance of the structure. Acoustiblok has a more linear (without dramatic dips and peaks) transmission loss than that of multiple layers of gypsum or hybrid gypsum designs encompassing adhesives. Independent lab tests show that one thin 1/8 inch layer of Acoustiblok added to a stud wall can reduce more sound than 12 inches of poured concrete. Rather than attempting to block or absorb sound as other materials do, the Acoustiblok material transforms sound energy into inaudible internal friction energy as the soft heavy material flexes from sound waves (virtually the same as lead without the environmental problems or costs). Acoustiblok’s QuietFiber®, an award winning industrial noise absorption material engineered for maximum absorbency, has been utilized in numerous theater constructions in conjunction with Acoustiblok material in the theater area to increase the STC and also in the public areas to absorb as much noise as possible. QuietFiber is rated at the highest noise reduction level of “NRC 1.00" (noise reduction coefficient). Areas with high noise levels that include sound reverberation like theater lobbies and public areas can easily be resolved by introducing QuietFiber® into as much of the area as possible. The amount of noise reduction in highly reflective rooms will be directly relative to how much of the QuietFiber® material can be installed into the room. It’s also fireproof, totally hydrophobic (will not absorb water or moisture), washable, non-deteriorating, mold and mildew-proof. Quiet Fiber is UL rated for floor, wall ceilings applications, is 100 percent recyclable and 100 percent made in the USA. Primary products include Acoustiblok® viscoelastic polymer based soundproofing material, Acoustifence® outdoor acoustical fence, All Weather Sound Panels®, QuietFiber® insulating material, Quiet-Cloud® industrial sound absorption panels, Acoustiblok WALLCOVER®, and Thermablok® aerogel nanotechnology thermal insulation. Acoustiblok products are used in industrial, residential, commercial, and marine sectors worldwide. The company’s products are 100% made and sourced in the United States. Acoustiblok Inc. ships products to more than 60 countries through a network of stocking distributors in the United States, on five continents across the globe and throughout the Mid-East. Acoustiblok products are distributed in the Mid-East by Acoustiblok Mideast. http://www.acoustiblok.com, http://www.thermablok.com.